‘Beyond personal, social and planetary borders and boundaries’. What a theme to base a gathering of 250 people from all over the world, of varying ages and backgrounds, of demographics and histories. A cultural melting pot of sorts, together in a space for entering dialogue and positive evolution. The Youth Initiative Programme, or as I now come to refer to it – YIP- raised the bar high when broaching and planning an event of this scale, in a world rife with tensions regarding borders and identities. The week I partook in early April here in Sweden, was the harvest of the 2017 ‘Yippies’ year-long course, a culmination of passion, dedication and urgency in facing the most pressing issues of our time. And it showed. Although I could write a succinct summary of all the lectures, workshops, classes, gatherings I experienced (this has been done), I chose to write instead what I took away as the diamond in the rough, as a New Zealander. Because the answer to this question is relevant to all of us, in asking what it means to have an identity, or a nationality, or the answer to the most common question we face when meeting new people today, the question of “where are you from?”. Grandmother Pauline headlined the IF this year, among many other inspiring and deeply touching presenters. That a Maori grandmother, an indigenous tribal voice was given the space to do this, in a group of young people, shows that the youth of today are truly ready and willing to not only hear and respect the voice of the elderly wisdom, but learn and integrate those learnings into our fast moving, modern society today. 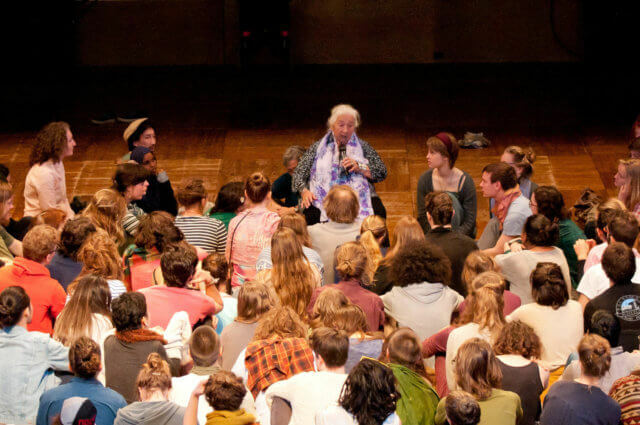 We, the young people of the Anthroposophical movement, are reaching out to our elders to bridge the gap between generations, and we realize more than ever the value of the indigenous knowledge. Her talk on the first morning after arrival both set the scene and painted a tapestry of where the week would take us. Her teachings were profound and eloquent – we live in a world where we have forgotten the nature of ourselves and our environment. Our worldview has become broken down into small fragments, or ‘bites’ of information and understanding, whereas what we need to return to and build upon is our holistic and circular perspective of our world, our universe and our place within it. Although we may have begun at the same place, we all do still have our own recent heritages and lands of birth, which makes for a complex reference point for building our concepts of ourselves. What makes this person a South African, this one Canadian and this one a Vietnamese – merely our place of birth and our cultural inheritance? Grandmother Pauline took the view that all people displaced from their land will never be truly happy. If this is true, then it accounts for the massive suffering and unhappiness we see in the world today, reflected in suicide, terrorism, disease, and the huge influx in refugees fleeing their homelands. Not to mention that indigenous cultures have been suffocated and supressed for centuries in most places- colonized and integrated into “white/Western” mentality. Hence, almost none of us are truly of one place any longer, rather, we carry pasts of interwoven generations, mixed family backgrounds, and homes in places that may be on the opposite end of the planet than that of which we were birthed. This question becomes ever more relevant in the light that climatic changes will result in many more millions of refugees fleeing uninhabitable areas, over the coming decades. We have experienced but the tip of the iceberg, a fitting metaphor for the accelerating melting of the ice occurring as we speak. I’m a New Zealand born person, a ‘Kiwi’, as we are known internationally. However, both my parents departed from Europe and met in NZ, where I was both conceived and born. Essentially, one of the most fundamental questions of my existence to date has been trying to untangle the traditional ‘nature vs. nurture’ debate, and pinning my origins down to one nationality. However, my learnings over the years have shown me that this debate is close to being debunked in its entirety, and replaced with the more appropriate term ‘nature in conjunction with nurture’. For while I may have European heritage, I was born and raised in the culture of New Zealand, and so the complex interrelationship between nature and nurture is not so easily untangled. Accepting the polarizing label of colour even with its usefulness at times- if we consider that every white person in NZ is a recent arrival to what was an island first reached by Polynesians several centuries ago (now referred to as Maori peoples), then surely, every person in NZ will have this question also. So, we are removed from our origins, displaced, scattered around the globe in small, isolated corners and huge, fast moving cities. Here in Sweden, I coexist in a neighbourhood with Swedes, Duchies, Germans, Brits, Thais, Syrians, Eritreans, Afghans, and no doubt Norwegians, Fins and Spaniards, to name just a handful. And before it sounds like I am reeling off a list of ‘breeds’, it really is that we live in a hyper connected and mixed world. Gone are the days where your place of birth dictated the life you would live, and the heritage you would bestow to your future generations- we now live in a world where identity is in constant flux, a testing of the waters for what could be possible- a world with a “global passport”, with no fixed borders. What is coming towards us, or we towards it, is a world, as Nicanor Perlas describes as “on fire”. If we rely on the media to tell us what is happening, and inform our daily mood and subsequent wellbeing, one may be forgiven for interpreting this metaphor as one where we are all going to burn and perish. This is the fear that our media creates. However, if we take this and shape it into the metaphor of a phoenix, gathering its strength, light and warmth before emerging into a powerful, beautiful Phoenix, open with possibilities, then we find assurance. We’re in a crux in 2017. We haven’t let go of the past and grasped yet that we create our future with every decision we make, and that regardless of our past we need to move forward. We’re still living in a time where conflict and struggle underlay our species fundamental natures and actions. We catch ourselves between wars, and battles and tensions, breathing fire into hatred towards Jews in one century, and fanning the flames for Islamophobia the next. You may be forgiven for thinking we cannot change, we repeat the mistakes of the past, following the leaders decrying those of a different ilk. That would be wrong. Like an infant learning to walk, we’re in a time where we are grasping, building the support and infrastructure needed to enable us to fulfil our full potential. Some call it the Aquarian Age, some in Vedic scriptures a transition from the Kali Yuga time, and recent scientific method is still finding a name for what can be seen in no other way than that of a time where we co-design, shape and manifest our destinies. Cognitive neuroscience is glimpsing the potential, the awe-inspiring truth that thoughts result in outcomes of our entire chemistry; in wellbeing, perspective, in the structure of complex molecules that make up our physical body. You could say that we are now witnessing our potential to realize that we are writing our own fate on the surface of Mother Earth. The YIP 2017 initiative was a coming together of these worlds- a true gathering of people inspired, awed, and fearful of the future. We witnessed it as the week went on, and all of us carry that energy out into the world wherever we may be now, a month later. We tasted the delights, the fears, the deep crevices of joy and despair that we each, every single one of us, regardless of which passport(s) we hold- carry within us. So, what does it mean to be a New Zealander? I think it means to be a global citizen. A human being of the world. Born into a land, 2 islands, on the edge of the ocean, or “down below” as it is referred to here in Europe. I constantly tell people I meet here that I am quite upside down, both metaphorically, and literally. But regardless of where we are born, or where our ancestors were born, we have one beautiful treasure in common- we were all born, and all still live on Earth. As connected as we are now, beyond distance, our borders are planetary. We created the internet to bring us together and share information, and that is truly the greatest tool we have now to become brothers and sisters in arms. The Yippies of past and present have an immense task to carry with them. From the seeds they planted years ago, to the current day; the roots are gaining hold worldwide. Nurtured by passion, curiosity and dedication to making a world of difference, these seeds are gathering energy. Like all good Springs, these buds make their way to the surface, ready, waiting, finding strength and sustenance in the Anthroposophical teachings of Rudolf Steiner. Will we wake up, and smell the Roses? So maybe to be a Kiwi is just a funny name for being a human bird. It’s to fly despite not having wings, and to explore, learn and assist each other, all of us, in our equal path of learning and awakening. We would be wise to heed Grandmother Pauline, and the indigenous Maori wisdom of our beautiful Aotearoa. For our land is a beacon of hope and light to those all over the world. We portray nature, peace and stability to outside, and however different the true reality really is, it is up to us what to do with this sacred Taonga, our treasure of opportunity. Our world may very well be on fire. In the words of Caleb Buchbinder, who in his joint presentation gave what to me was the most heartfelt and poignant words of the forum- “set your life on fire and seek those who feed your flames”. Dive in. If not now, then when? If we cannot set ourselves aside, and work towards the common goal of survival, then why are we here? We’re here to be human beings on planet Earth. Not a planet of human beings. We’re here to sculpt our precious lives and contributions into a future for each one of us that reside on Mother Earth. Not because it might be fun to try, or because we want to, although surely it is both of those also. But because we can all do it, however large or small we feel our contribution may be. Every single person’s biography and experiences weave the tapestry of humanity, past, present, and future. We have a responsibility. To all those that came before us, and to all those that come through and after us- we must take the mantle. It is our duty, our task and our joint destiny. And it may very well be our saving grace.